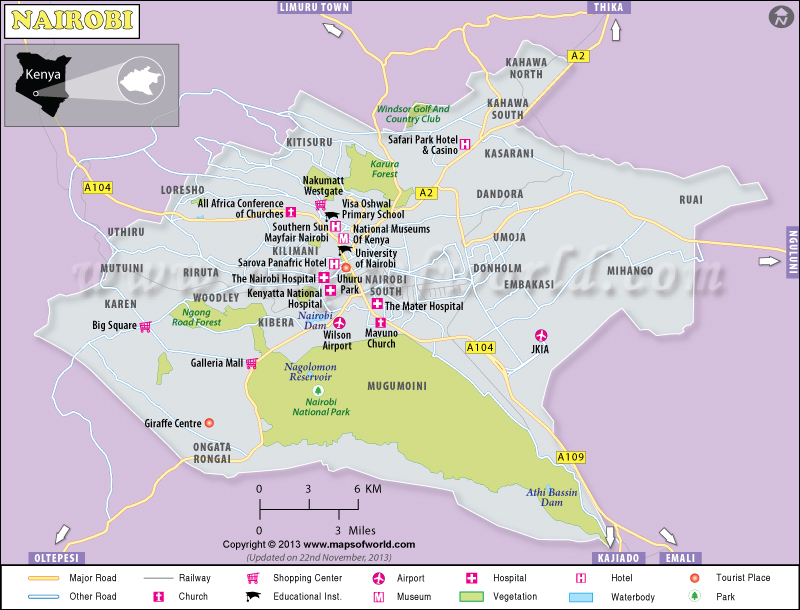 Nairobi is the capital of Kenya and also its largest city. Nairobi is surrounded by the mountains of Mt. Kenya on the north and Mt. Kilimanjaro in the southeast. 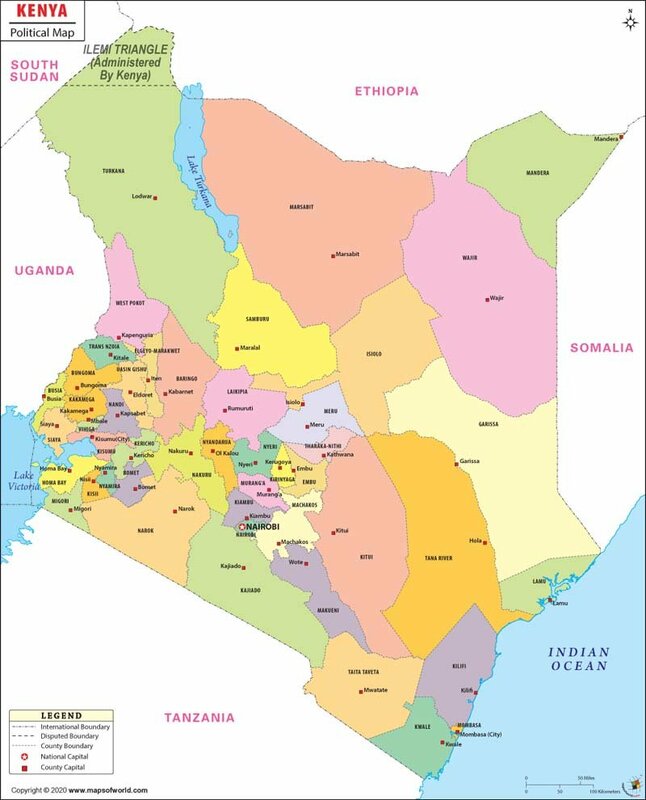 Because it is located adjacent to the eastern edge of the Rift Valley, Nairobi is vulnerable to occasional earthquakes and minor tremors. The Ngog Hills are the most prominent geographical feature of the city, which look like knuckles of the back of the hands facing the sky. By Plane - The primary airport serving the city is JKIA Jomo Kenyatta International Airport, located southeast from the city center. By Train - The Nairobi Railway Station serves trips to Mombasa on the east and Kisumu to the west. By Bus - The center of Kenya's bus network is found in Nairobi, with routes serving domestic destinations. By Taxi - Taxis are rather expensive but provide the most convenient mode of transportation. Setting and agreeing to a price is encouraged before riding the taxi, and payment is made only when destination is reached. Registered taxis have yellow lines on both sides of the car. A great option for sightseeing is to hire a taxi for a full day. By Matatus - Minibuses that seat 14-18 people and shuttles that seat 6 passengers are the most inexpensive and most convenient way to get around the city. The best time to visit Nairobi is during the dry season - from July to October. Visiting Nairobi is never complete without a safari experience and you'll get the most out of it during these months. Due to a scarcity of water, animals gather on waterholes, rivers, and lakes - making them easier to find and spot. Kenyan Music Festival - A presentation of the best student musicians of Kenya, this yearly event is held at the International Conference Center. Groups who perform are selected from school regional competitions. The different categories include dance, vocal, and instruments, with 3 different music genres, which are Oriental, Western, and African music. Lola Kenya Screen Film Festival - A festival devoted to children, activities include workshops, trainings, and screenings of animated films, documentaries, and dramatic films. Storymoja Festival - Held annually at the Nairobi National Museum, this festival is 5 days of celebration with activities ranging from storytelling, writing workshops, discussions, and presentations of national and international writers. Nairobi National Park - Nairobi is the safari capital of Africa, and it's mainly due to this national park. Located only 7km from the skyscrapers of the metropolitan, the park is the best place to spot exotic wildlife. Get to see lions, cheetahs, gazelles, zebras, ostriches, and over 400 different bird species. Giraffe Center - At the foot of the National Park is the home of endangered Rothschild giraffes. A favorite among children, a tour to the National Park is never complete without visiting this center. Karen Blixen Museum - The former home of Dutch author Karen Blixen, this colonial farmhouse is now a museum of the late author's life and works. The famous writer who penned Out of Africa, she stayed here from 1917 to 1931 and wrote the famous novel during those years. The well-preserved house and landscape is one of Nairobi's most visited attractions, with tourists being able to tour the inside of the house and get to see Blixen's original works, her house items, and original documents. The Ngog Hills - An area that looks more European than African, this area is characterized by its half-timber houses and flower gardens. With a view overlooking the Great Rift Valley, visiting the hills is a peaceful experience with nature. There are walking trails that provide spectacular views and wildlife is also abundant, allowing you to spot animals from a safe distance. For fans of Out of Africa, Karen Blixen's lover's grave is located on the eastern slopes of the Hills. 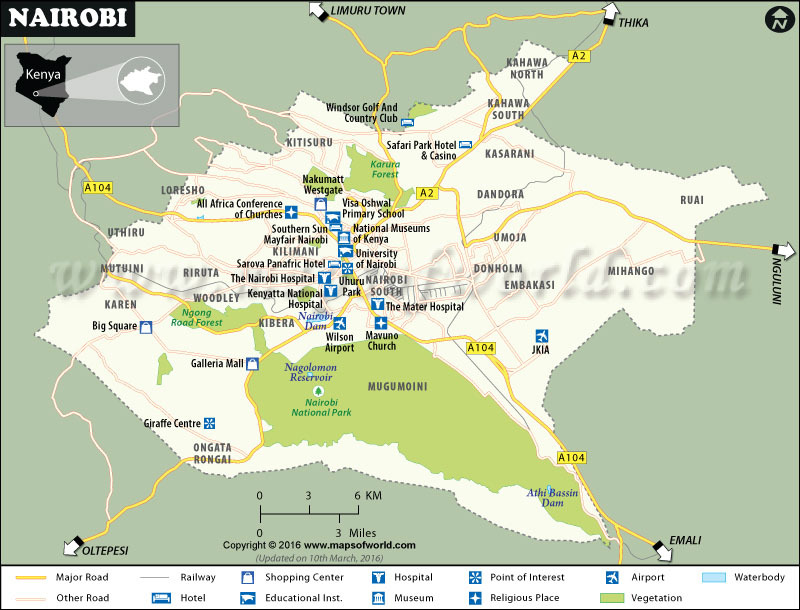 There are hundreds of places to stay in Nairobi, with most of them concentrated in the city center. For a unique African experience, lodges and luxury resorts can be found in the bush and on the beach.